Bare Root Beth Pear Tree. Click the link for Containerised Beth Pear Tree. 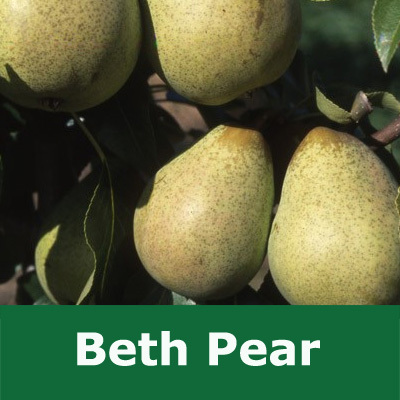 Beth Pears are not known for their shelf life but what they lack in longevity they more than make up for in taste and early ripening. Don't think that the only way you will be able to eat these pears without getting a mouthful of pear mould is to eat them while they are still on the branch, stick them in the fridge and you should get a few days more out of them. They are also known for reaching maturity faster than many of their pear cousins so you should get fruit earlier from this pear tree compared to similar root stock pear trees. If you have a small garden then the Beth pear is for you as it has quite a tight growth habit. It is also recommended by the RHS but we couldn't find out why.